Unicorns of Love announced today that Roman Bigeard, the team’s manager most well-known for donning the horn and regalia of the team at many events, will part ways with the organization. Over the course of his time with the Unicorns, Bigeard took a rowdy team known for cheesy pick and crazy games, and gave them a face and brand. Beyond just appearing as the team’s mascot at events, Bigeard appeared in promos and videos, building up an international fan base for the Unicorns. In Bigeard’s statement, he thanked his team and reflected fondly on the times he had with them. 10 years ago I had no clue e-sports even existed. 5 years ago I was a SC2 fan rarely playing LoL. 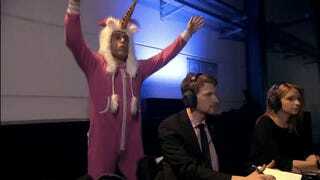 3 years ago I would have never imagined what it meant to work for an e-sports team. 2 months ago I would have never imagined leaving UOL. And still, today I am quitting probably one of the best jobs in the world. It has been a wonderful experience working with such great people like Jos and Sheepy. A family-sized company like UOL allows you to work in different fields as they have a limited amount of employees to perform all the tasks. From business to management, from coaching to social media, I had the chance to learn and try a lot of things while being surrounded by smart people. For that I thank you all. I went all-in: breathing, thinking and living as a Unicorn. It was incredible. Today I am leaving UOL, to go on a new adventure and face new challenges. I received an offer of that kind you cannot refuse, and I will take it. It is a huge step for me, and I believe I am making the right move. I do apologize in advance to those this decision will disappoint. I now carry a heavy heart colored with wonderful memories. I won’t cry because it is over, I will smile because it happened. 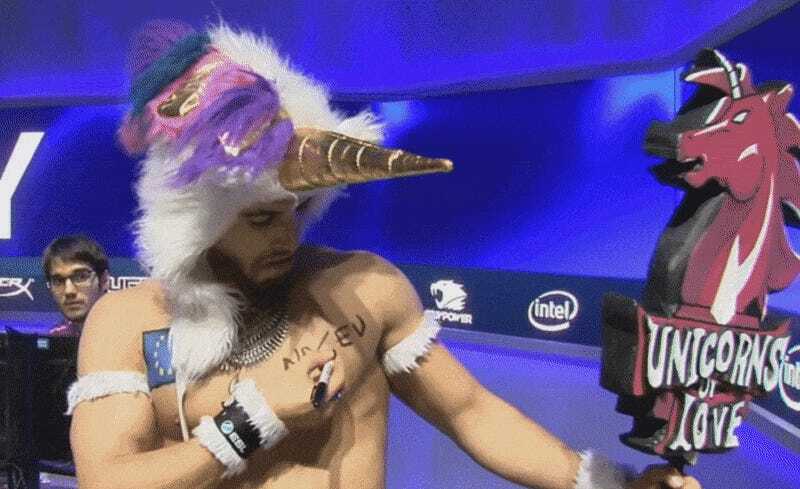 Wherever Bigeard goes (hopefully staying in esports and to another team in dire need of a good mascot), we’ll always have those fond memories of shirtless EU hijinks and that beautiful pink onesie.